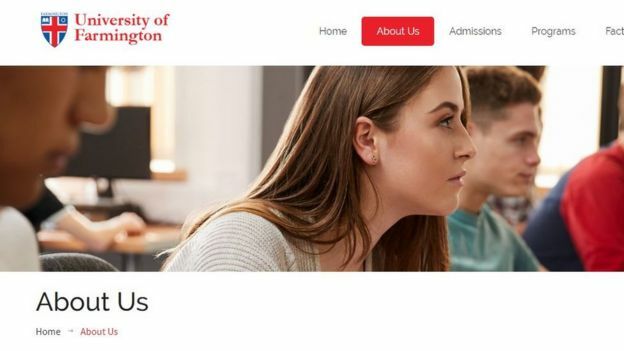 The arrest of 129 Indian students in the US for enrolling in a fake university has sparked questions about how they ended up risking their future to study at a little-known institution. 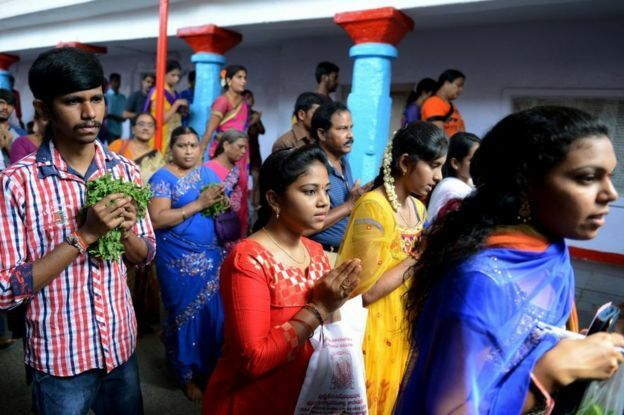 BBC Telugu's Deepthi Bathini reports. Veeresh moved to the US in 2014 for a master's degree at the Northwestern Polytechnic University (NPU) in California.He graduated in 2016 but NPU lost its Science, Technology, Engineering and Mathematics (STEM) accreditation. This accreditation makes students eligible for an extended work permit. Without it, Veeresh could have only worked in the US for one year. So he decided to enrol at another university. He says a friend told him about the University of Farmington and put him in touch with a recruiter, who was among those arrested. Farmington offered online courses and what is called curricular practical training (CPT). This is an option that allows student visa holders in the US to work full-time while they study. Although several colleges offer this option, it can also be misused by students who wish to work rather than study in the US. Veeresh enrolled in October 2017 and he received his CPT the following day. He says he did what he could to verify the college's credentials. He visited the website, which showed pictures of students in classes, libraries or elsewhere on campus; he compared the documents he was given to those belonging to his friends from other colleges. "I called the phone numbers on the website to ask about classes. I was told they would let us know when they schedule them," he said. "After six months, I asked a friend to contact the recruiter, who connected us with someone who again told us they would let us know." He claims not to have suspected anything and so paid the tuition and waited for more than a year for classes to begin. "I did not have any other option," he says. Meanwhile, he continued working and applied for a H1B visa, a non-immigrant visa that allows companies in the US to employ skilled foreigners - mostly technology workers - for up to six years. It's allocated by a lottery system and those who hold the visa can apply for permanent residency and buy property in the country. Twenty-five-year-old Sravanti (name changed on her request), graduated from NPU at the end of 2016. Like Veeresh, she only had a one-year work permit. So she also enrolled in Farmington and got a CPT that enabled her to work in the US. But unlike Veeresh, she could not leave the US in time. On 30 January, she says, officials from the Department of Homeland Security came to her house n California to question her. "I am wearing an ankle monitor and I have been advised not to leave the country without informing them," she told the BBC over the phone. She says she found out about Farmington from a friend who had already enrolled there. But she says that although she paid the tuition, she did not visit the college website or verify any of the information she was given. She was unable to answer why she did not suspect something was amiss when the online courses didn't start. Sravanti says she has been told she can opt for "voluntary deportation" but that would include a 10-year ban from entering the US. The other option is to wait for the court hearing in March - and hope that a lenient judge could reduce the length of the ban. "I am very confused. I want to come back to India but my future looks uncertain," she says. "I am at home through the day. I have nothing else to do. And I am running out of money." She says her parents know the truth and have been very supportive. The US state department has denied India's claim that students like Veeresh and Sravanti may have been duped. 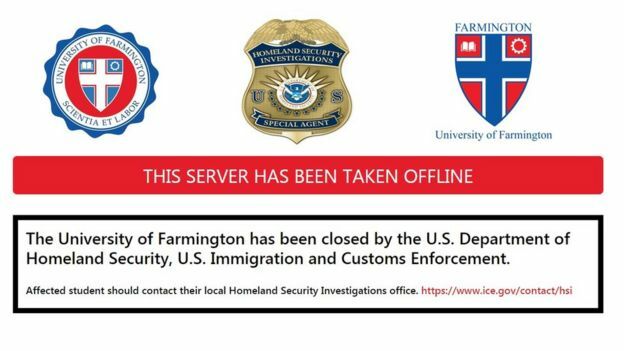 "All participants in this scheme knew that the University of Farmington had no instructors or classes (neither online nor in-person) and were aware they were committing a crime in an attempt to fraudulently remain in the United States," a spokesperson told the Hindustan Times. Veeresh had taken a loan of 1.5m rupees (£16,300; $21,000) to help pay for his education. The first university cost him $30,000 and Farmington cost him an additional $20,000. He had to borrow money from his friend to buy a ticket to come back home. He still hasn't told his parents why he returned. "They think I am on vacation. But the truth is that I have no job and a college loan to pay off. My parents would be devastated if they knew the truth." His parents are farmers and Veeresh had hoped to help them out by earning an income in dollars, some of which he could send home. "I am the only son. I wanted to take care of my parents. We do not own land or a house. I wanted to go to America to earn better so that I can buy a house for my family in India." This dream - of an American job that pays in dollars - is what motivates most students, says Bhaskar Pulinati, founder of Groovy Overseas Education Consultants. "More than 90% of the students are looking for a path to permanent residency. Very few of them are concerned about the reputation of the university," he adds. He says that is why many students prefer Canada and Australia, which offer an easier path to becoming a resident. But the US remains a top choice. "For a student, the priority is to go to the US," says Sirisha Singavaram, a consultant based in the southern city of Hyderabad, where the US consulate issues more student visas than anywhere else in India. "We do get requests from students who desperately want to go and ask if their documents can be 'edited' so they can enrol in a US college but we deny such requests." She adds that the problem is most students do not understand the application or visa process and end up relying too much on brokers and consultants. Veeresh, meanwhile, is looking for a job in Hyderabad. But he is still hopeful of returning to the US. "To achieve my dream of having my own house and to be able to take care of my parents, I want to go back to the US for a few years."